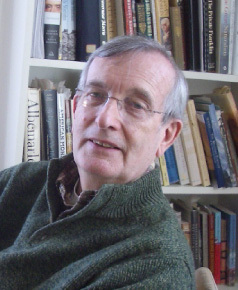 Keith Thomson is Executive Officer of the American Philosophical Society and Professor Emeritus of Natural History, University of Oxford. I have had a wonderful career as a professor of biology and dean (at Yale), a museum director (Yale, Philadelphia, and Oxford), and more recently as an author. I started out as a biologist interested in the evolution of fishes and the origin of major features in the transition between fishes and tetrapods. That inevitably drew me both to paleontology and to study of the “living fossil” lungfishes and the extraordinary living coelacanth. In 1966 I obtained for study the first fresh specimen of the coelacanth from the Comoro Islands (Living Fossil, Norton, 1991). My overall goal was to understand fossils in the same physiological, biomechanical, and ecological terms as we study living animals. In the process I have published on subjects ranging from the evolution of cell size and DNA content in lungfish, and intracranial mechanics in the coelacanth and its fossil relatives, to the origin of the tetrapod middle ear and the body shape and swimming mechanics of sharks. From an early interest in embryology, it was but a short step also to what is now called (rather unhappily) “evo-devo,” or the study of the roles that developmental processes play in evolution, and to writing Morphogenesis and Evolution (Oxford University Press, 1988). After having been supported by NSF continuously for some 20 years, I cheerfully stepped off the grant treadmill, and in recent years I have had immense pleasure in studying the history of science and in writing for a popular audience, starting with the column Marginalia in American Scientist that I have written for thirty years. My current interests range from Thomas Jefferson and 18th-century science to Charles Darwin. Recent books include Treasures on Earth (Faber and Faber, 2002), Before Darwin (Yale University Press, 2005), Fossils: A Very Short Introduction (Oxford University Press, 2005), The Legacy of the Mastodon: The Golden Age of Fossils in America (Yale University Press, 2008), A Passion for Nature: Thomas Jefferson and Natural History (Thomas Jefferson Foundation, 2008) and The Young Charles Darwin (Yale University Press, 2009). Jefferson’s Shadow: the Story of his Science (Yale University Press, 2012) was the culmination of several years of work as a visiting fellow at the International Centre for Jefferson Studies at Monticello. Due in 2015 is Private Doubt, Public Dilemma (Yale University Press) based on my Terry Lectures at Yale in 2012.